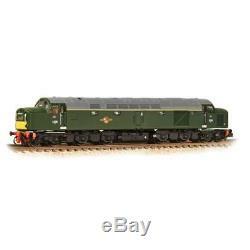 GRAHAM FARISH 371-181 N SCALE Class 40 D369 BR Green Centre Head Code. GRAHAM FARISH 371-181 1:148 N SCALE Class 40 D369 Centre Head Code BR Green Small Yellow Panel DCC Ready. Class: CL 40 Livery: BR Era: 5 (1957 - 1966) Wheel Configuration: A-Co-Co-A Finish: Pristine. Decoder: 18 Pin Sound: Speaker Housing Couplings: NEM Track Supply: DC 2 Rail. SCALE: N Scale = 1:148th. Bank Transfer BACS payments, should you wish to pay by this method please tick the other box at the checkout stage and we will send you details on how to proceed. Postal Orders and Bank Drafts. Payable to SHEFFIELD TRANSPORT MODELS. Quality, secure packaging is always used [please see our feedback]. In order to receive the maximum discount please wait until a combination invoice is sent this will include the discount, do not pay separately as you lose the discount. PUFFERWILLIES is now in partnership with local model shop SHEFFIELD TRANSPORT MODELS who have been in the model industry for over 35 years. We now offer a comprehensive range of products from all leading manufacturers, covering all aspects of Model Railway , Diecast Vehicles , Slot Racers , including Scalextric , and a huge range of new and used Transport Books, DVD's etc. And of course the best in Scenery. Currently we have around 12,000 products available on line, Please take a look when you get the chance and feel free to telephone us for helpful and friendly advice. Get images that make Supersized seem small. Tailor your auctions with Auctiva's. The item "GRAHAM FARISH 371-181 N SCALE Class 40 D369 BR Green Centre Head Code" is in sale since Saturday, February 3, 2018. This item is in the category "Collectables\Model Railways & Trains\N Gauge\Locomotives". The seller is "pufferwillies_sheffield_transport_models" and is located in Sheffield.